A SensaSynth2 preset is a collection of data that designates a value for each of the configurable parameters that determine the appearance and interactive behavior of a Sensacell panel. This information also includes data about Start Conditions (things that happen when a preset is first loaded) and End Conditions (which generally designate triggers for the transition to the next preset). The exact definition of each parameter can be found in the Technical Documentation, but the Make Presets and Sequence Presets sections provide user-friendly ways to set these parameters. These two non-editable numerical displays show the Current Active Preset and the Total Number of Uploaded Presets. 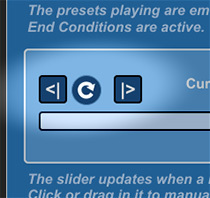 When a preset transitions, the Current Active Preset value updates, as well as the slider position below. In addition to using the slider, you can use these buttons to either restart the current preset (so that it will execute its Start Conditions again), or play the previous or next preset. The presets wrap around from last to first and vice versa. Click the Upload Preset button to open a standard File Open dialog box. Identify a preset file (it will have a .ssp extension) and upload it. Alternatively, drag-and-drop a .ssp file from Windows Explorer over the bullseye icon. Every upload to the panel replaces any and all previously uploaded presets or collections so be aware that you are permanently changing the panel content. To “restore” a previous set of presets to the panel you would need to have the preset files or the preset collection available to upload again. To temporarily view a preset without changing what is uploaded, open it in the Make Preset section. Keep in mind, however, that some preset functions and behaviors, those that stem from certain Start Conditions or interactive behaviors in particular, do not function the same when temporarily displayed in the Make Presets section, so this section is the best way to preview a preset for a final installation. You cannot use this to upload more than one preset at a time. 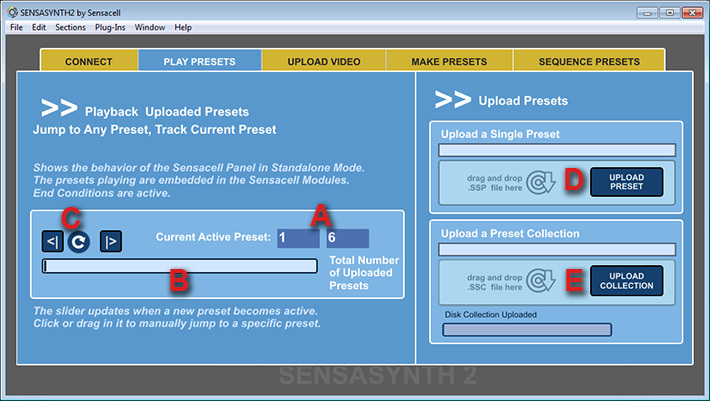 To do that Upload a st of presets from Sequence Presets or use the Upload a Preset Collection interface demonstrated next. Preset Collections are made in the Sequence Presets section and have the .ssc extension. Use the button to open a standard Windows Open File dialog to identify the preset collection you want to upload or drag-and-drop a Preset Collection file from Windows Explorer. 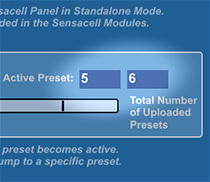 As with the Upload a Single Preset interface above, be aware that uploading a Preset Collection replaces any and all presets from the on-board memory of your Sensacell panel.